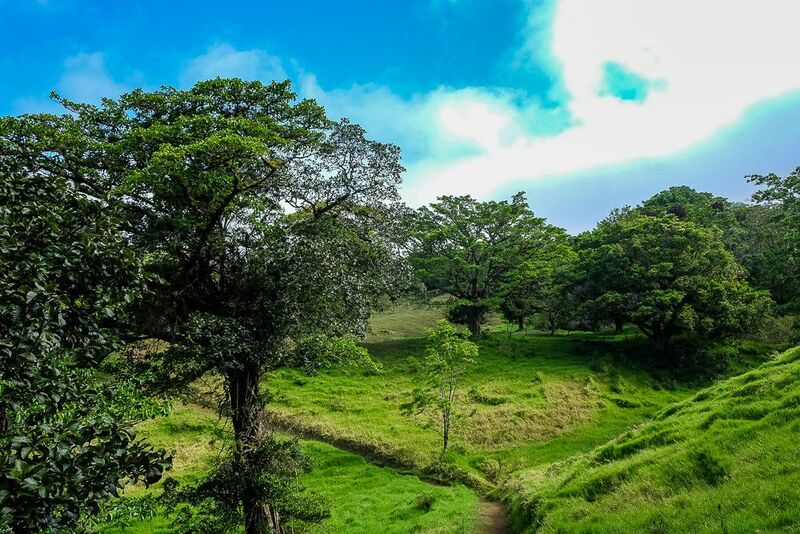 Want The Best Monteverde Tours? Nasua Tours Has You Covered. 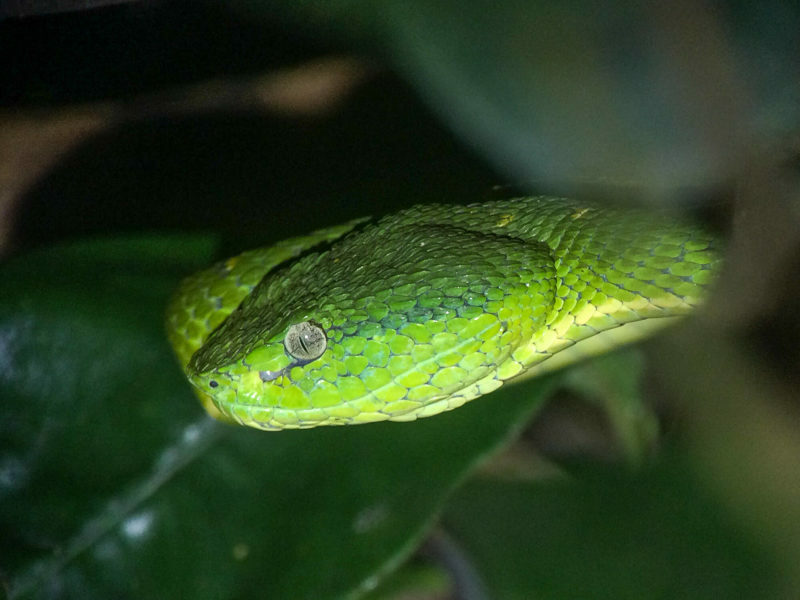 Want to See Wildlife in Monteverde? Nasua Tours Has You Covered. I was not planning on hiring a guide during our time in Costa Rica. Would we really need one? But the more and more I read, the more I heard that if you wanted to see wildlife, you needed to hire a guide. But the guided Monteverde tours put on by the main reserves seemed pricey and crowded. I wanted a small group with a passionate guide. Enter Nasua Tours. I stumbled upon Nasua Tours on Trip Advisor and was immediately intrigued. And after few minutes investigating the website, I was sending off an email. This seemed perfect. Small groups. Good times. Transportation included. Night tours and daily tours. And decent prices. Oscar replied quickly and after a few emails, I decided to do both a night tour and a morning tour. And I couldn’t have been happier with our decision. Our first tour with Oscar was the night tour. 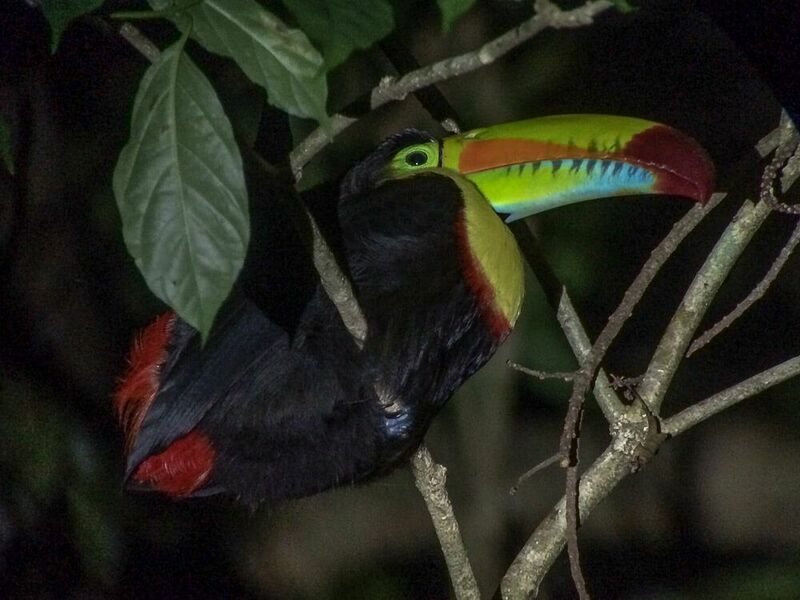 While we had an option of where we wanted to do our day tour, the night tour is always done at the Monteverde Wildlife Refuge. This is a smaller reserve and located closer to town. 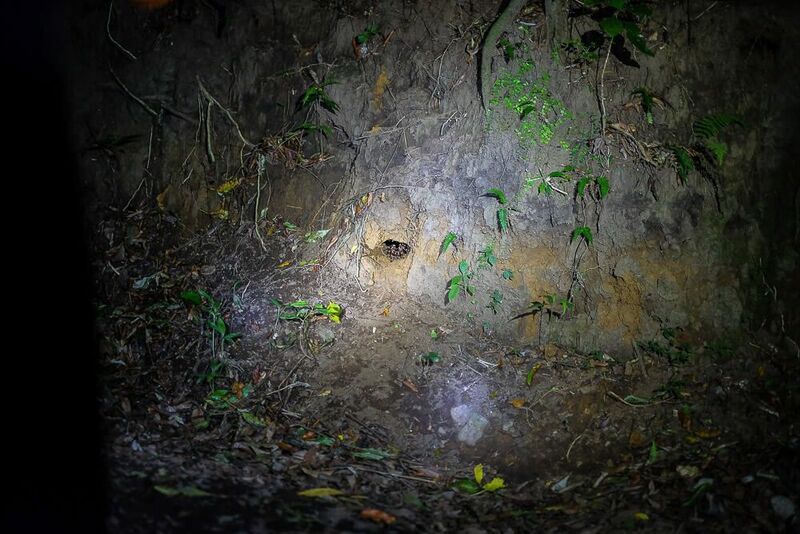 But after years of doing guided tours Oscar let us know that is the best place to spot wildlife at night. He picked us up at our lodge in town and headed towards the Refuge. The only other people on our tour was another couple who met us there. During the 10 minute drive, I instantly started to feel great about my decision. Oscar, the owner and sole tour guide of Nasau Tours, was one of the most passionate people I’ve ever met. He loved what he did. He loved Costa Rica. He loved sharing his country and passion with others. And his enthusiasm was infectious. 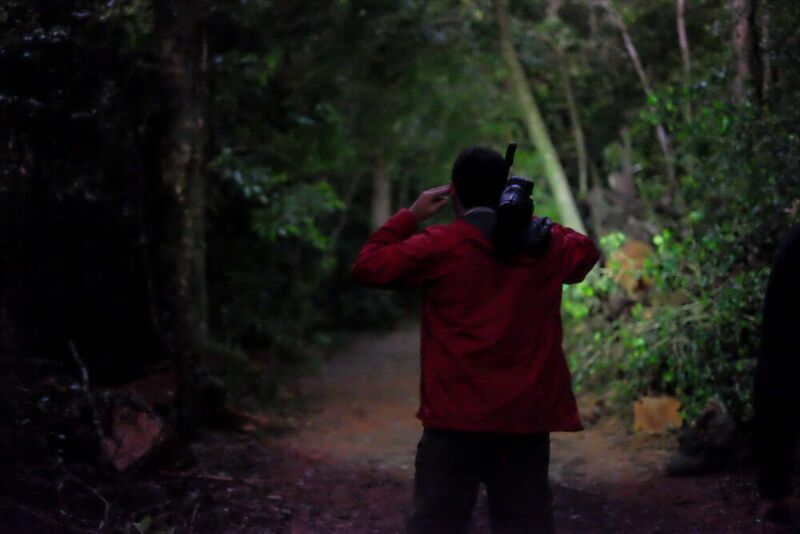 By the time we reached the Refuge and had our flashlights in hand, I was ready to get my wildlife watching on. And it started off immediately with the one thing I thought I would be terrified to see…a tarantula. 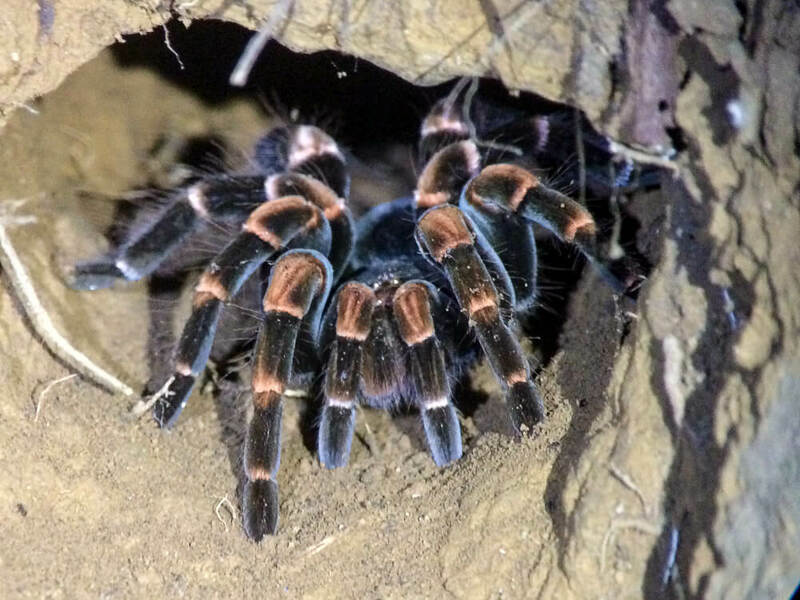 The female tarantulas find themselves a large hole, and then at night, come near the entrance to hunt. And there she was – just chillin. We got some pretty great views of her through Oscar’s scope, but we could still see her clearly with our naked eye. The only downside, a group passed by – basically stomping the ground – which scared her back into her hole after only a couple of minutes. Taken by Oscar with our iPhone through his scope. 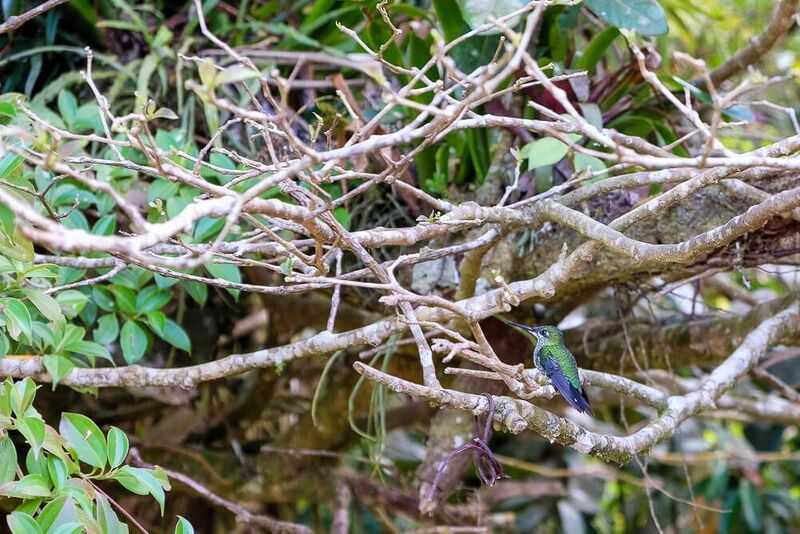 Our next few discoveries were some sleeping birds: a toucan, a toucanet, and others. I loved seeing the toucans. One was even awake, simply sitting there in the dark. But as we were packing up, another group came by and their guide motioned further down the trail. Now Oscar was walking quickly in the direction the guide pointed. He was waving us onwards, telling us to hurry. As we rounded a corner we could see ten people gathered around the base of a tree, all eyes pointed skyward. There, above us, a brown raccoon-sized animal was finishing up a meal in the tree. Oscar began talking quickly, trying to follow the animal’s movement with his flashlight. The olingo is a small mammal (similar to a raccoon) that stays high up in the trees, jumping from branch to branch to get around. However, unlike other animals in the area, the olingo’s tale is solely uses for balance (aka not prehensile). Each one of those little leaves is being carried by an ant. Next up Oscar told us about the various different types of ants. 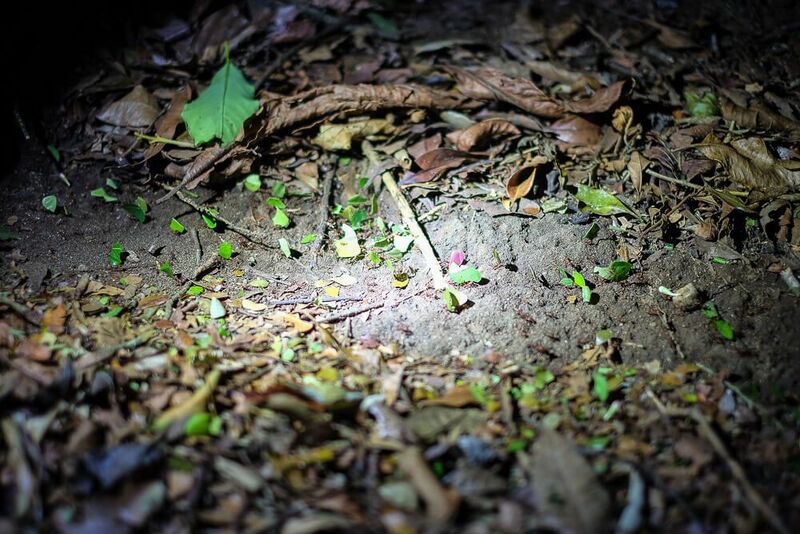 First there is the leaf cutter ants. Hard workers, they can decimate a tree (or a garden) in a couple of days or even overnight. Oscar explained how the ants take away the plant’s leaves and then carry them back (sometimes over 1km) to the nest. But then they don’t even eat the leaves – it’s all used for fertilizer to grow other food. Then there were the army ants. As Oscar spotted this colony, he motioned us to the far side of the trail. As you can guess by the name, they are not very friendly. And their bite hurts…a lot. We got close, but not too close. Oscar was wary of us stepping near the colony as it marched on down the trail (carrying the larvae of another colony it had just destroyed). After we left the colony, he made sure to check our shoes and pants for stray ants. Onto our last stop Oscar paused suddenly, shining a light into the trees. His eyes widened and gasped. Setting up the scope he motioned us over quickly. A kinkajou. Slightly larger than an olingo (and with a prehensile tail), the Kinkajou was our second mammal spotting of the night. And though he fled quickly after we arrived, we were each able to look in the scope to see him. Oscar finished up our night tour with a scorpion. Carefully turning over a few logs, he found a small one. 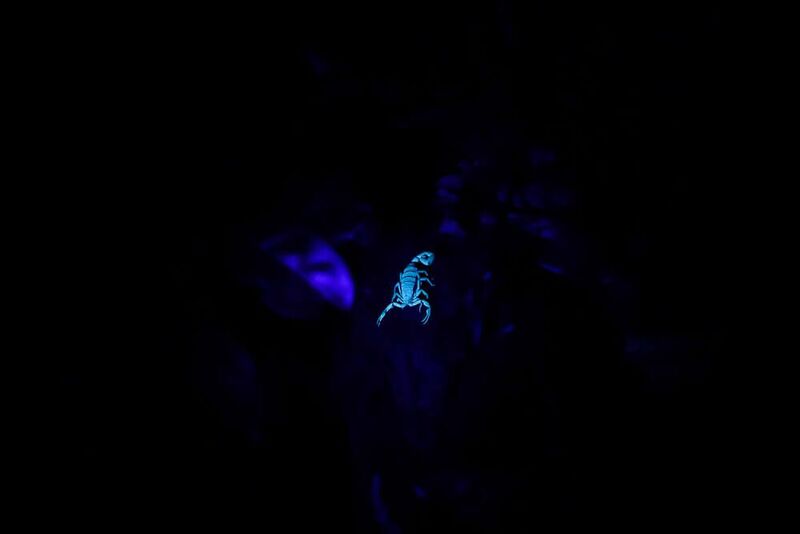 And under his black light, the scorpion’s skin (or is it scales?) reflected brightly. Tarantulas. Ants. Scorpions. Vipers. Who knew I would be so excited to see things that would normally have me running in the opposite direction? But I was thrilled and excited (again – Oscar’s enthusiasm was infectious). And I couldn’t wait for our morning tour. I had decided on Curi-Cancha for our day tour since Oscar had mentioned it was more open and would allow for better animal spotting. It also covered 2 different life zones and therefore gave us a chance to see lots of different wildlife. As soon as we hopped out of the car, just in the parking lot alone, Oscar was already setting up his scope and pointed to the trees around the admission area. 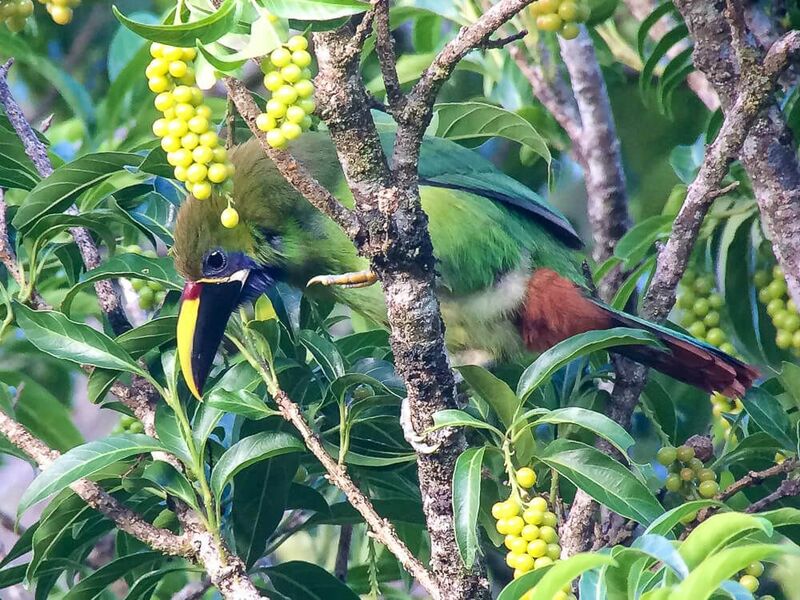 A small green toucanet was calmly eating berries out of the trees around us. All of the close up photos here (including this one) were taken by Oscar with our iPhone through his scope. 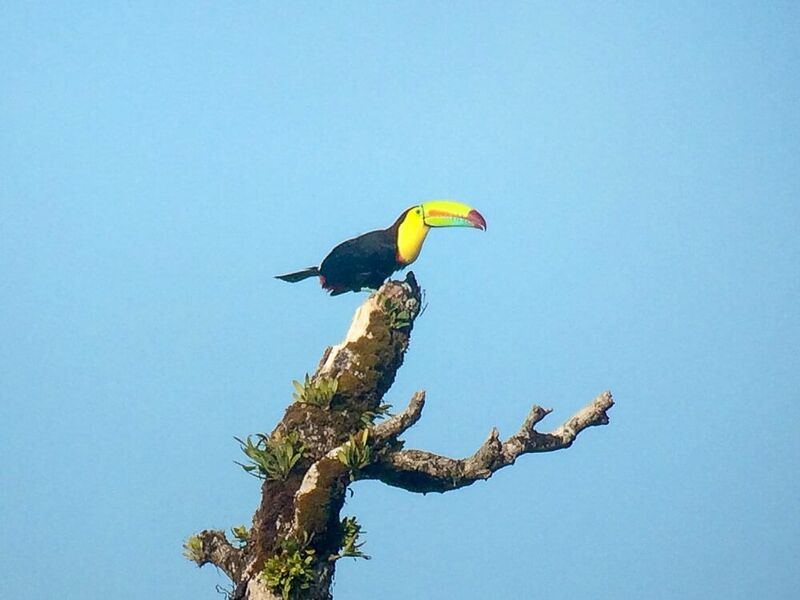 About 30 minutes later, we would spot another toucan far away at the top of a tree across a small valley. I’m not sure what I was expecting a toucan to sound like, but definitely not this loud noise. Also I learned that toucans are kind of jerks. Oscar told us that toucans will take over the nests of other birds and eat their babies. I couldn’t believe it. This beautiful bird is actually extremely vicious. And I began to notice that when the toucan calls, the other birds in the area scatter and quiet. Oscar also pointed out a sleeping olingo high up in the trees. But the real fun began when we entered the clearing that had several wild avocado trees. It was quetzal time. This is like the bird to see in Costa Rica. And we were there during peak quetzal viewing time. The quetzal is a beautiful bird native to the mountainous forests of Central America. 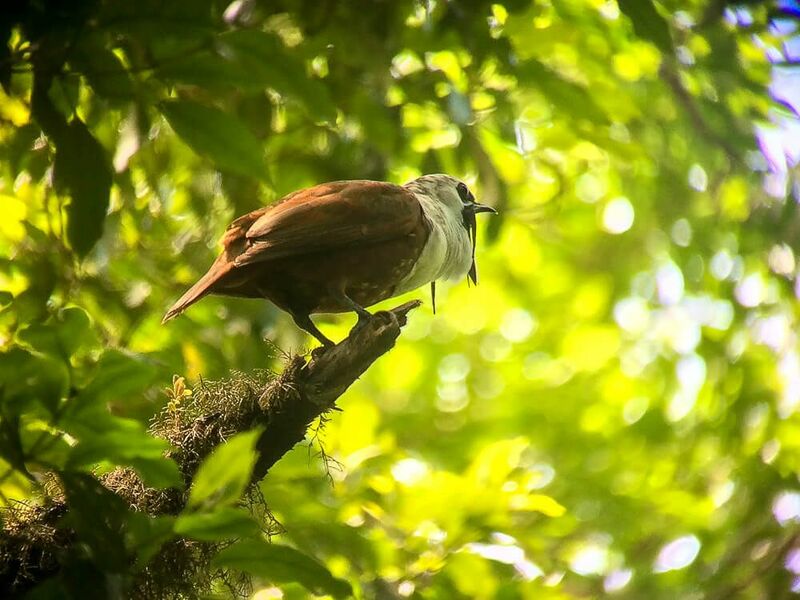 It is Guatemala’s national bird – but is so threatened there (due to mountain forests being cut down for coffee plantations) that you can only really find them in Costa Rica. And the bird is beautiful. We stood and watched a pair of quetzals for a long time. The males, during mating season, grow long, colorful tails. These tails can be up to 3 feet long (though the male we saw only had a tail about a foot long). They had both just eaten and were resting and digesting. The females are little less colorful, but still have the same iridescent green feathers. The wild avocado grove was also the place to be for other animals as well. We saw large turkey like creatures roosting in the trees and agoutis scouting beneath them. Another group saw a toucan far away in some treetops, but I’m glad he didn’t come closer and scare the quetzals away. 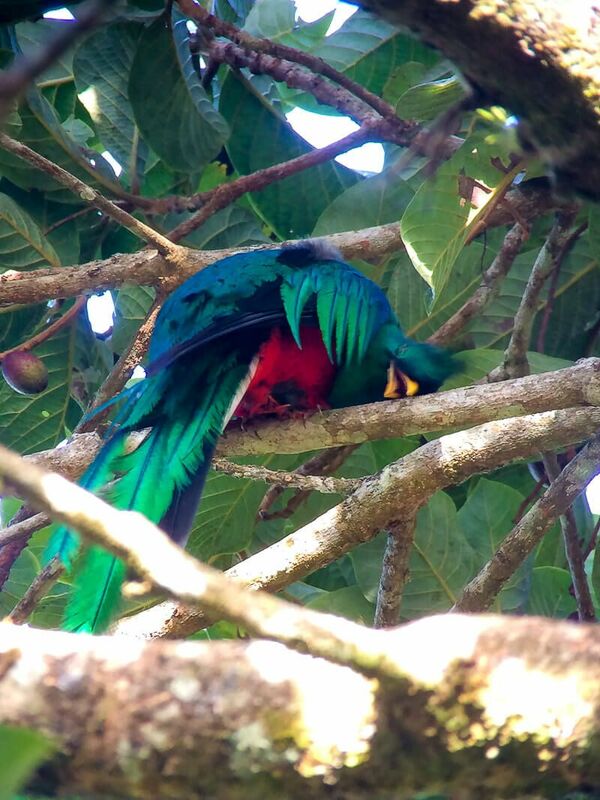 Another fun quetzal fact? Oscar told us that an Aztec emperor’s crown was made up of over 300 quetzal feathers. And you can still see the crown today (though it’s in Austria). 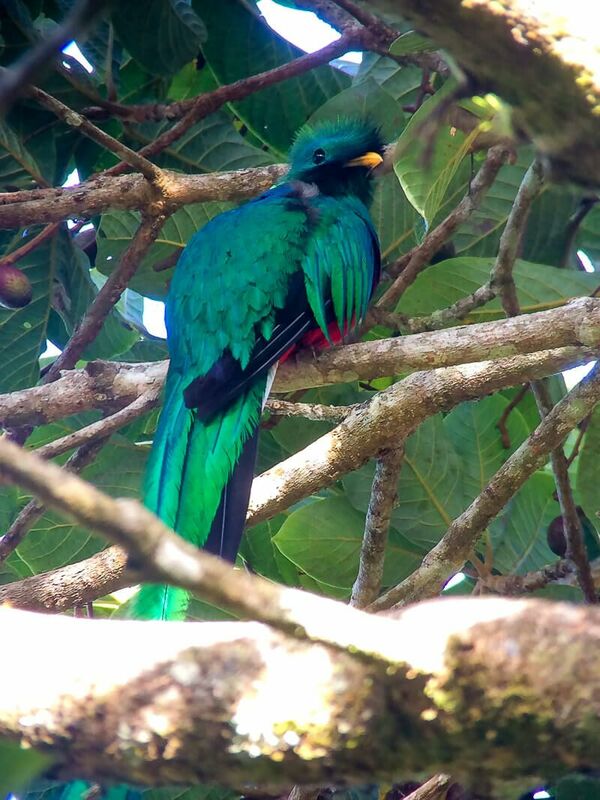 After admiring the quetzals for quite some time, we moved on. 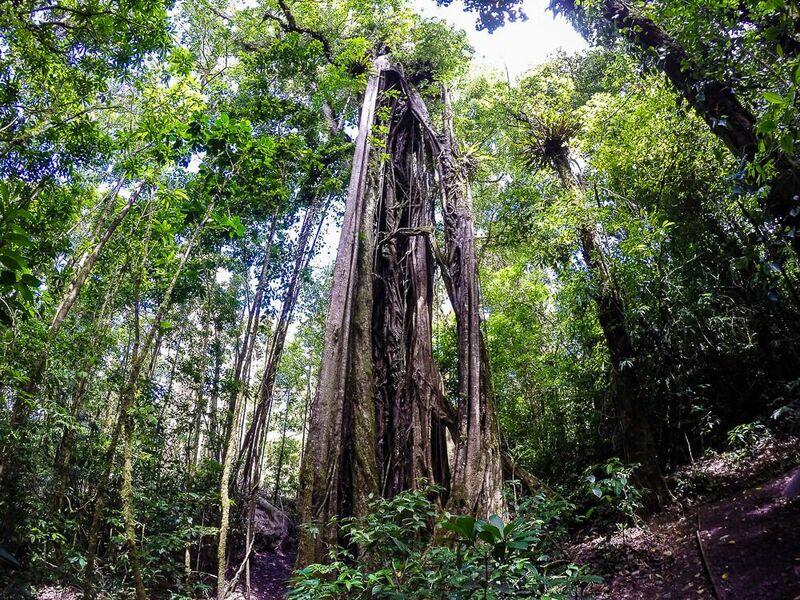 We saw other birds, pit vipers, micro orchids, bullet ants (and we definitely didn’t get too close to them), and admired many a strangler fig trees (I loved how these weird trees looked). 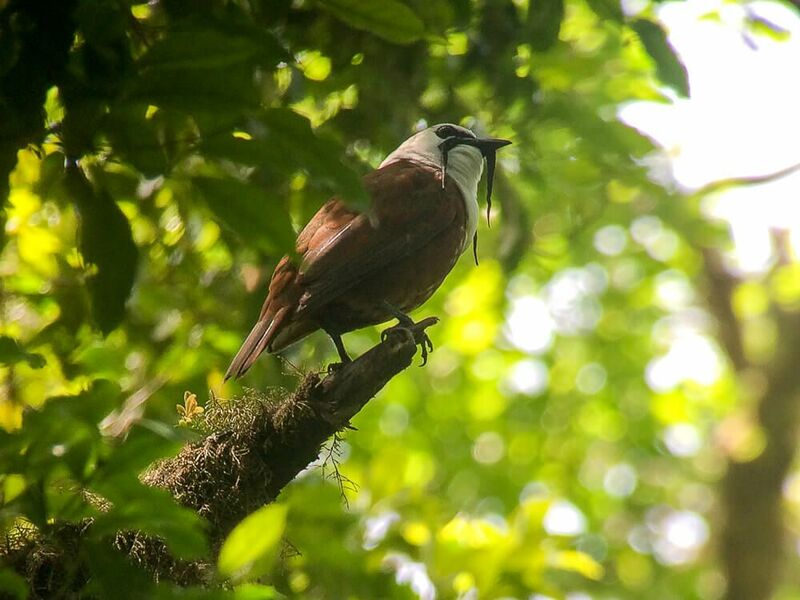 But our last big discovery of the day was the bell bird. We had heard him off and on all day, but Oscar was unable to locate him until we were on our way back. Finally, he tracked him down. The bell bird has a 3 part song. Oscar would count off the lighter call…1…2…3. And then…BONK! This “BONK” is the namesake of the bell bird and it is loud! The male we found was younger. But through the scope we could see him perch and then lean forward and open his mouth as he bonked. The other weird thing about the bell bird? The long wattles that hang off the males’ faces. To me they looked like long, weird handlebar-esque moustaches. And on older birds they are even longer. But I guess if you are a lady bell bird then you would just find them divine. Our tour came to an end as the forest began to warm up around us. We were back at our lodge and ready for lunch before 11am. And though we didn’t see any real mammals that day (the sloth continued to elude me), I still highly enjoyed my time with Oscar. 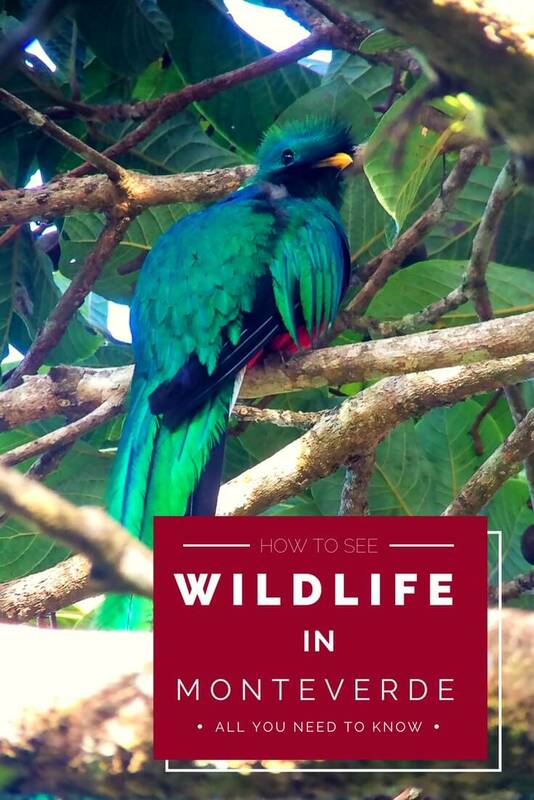 We saw lots of birds – including the quetzal and the bell bird. And we learned a lot about the forests in Costa Rica. As I’ve mentioned, Oscar loved showing us around Curi-Cancha. And his enthusiasm for sharing his knowledge of the area and its animals was completely infectious. So if you are thinking about Monteverde tours, then think no further than Nassau Tours. Oscar was the best. Night Tour. Our night tour with Oscar cost $30 per person ($7 of which went towards the entrance fee to the refuge). Oscar picked us up at 5:40pm for our night tour. Day Tour. Our day tour with Oscar cost $20 per person – entrance fee not included. Our entrance fee to Curi Cancha was $15 per person. So our total was $35 per person for Curi-Cancha. If we had done the tour at the Monteverde Reserve, it would have cost more since the entrance fee at Monteverde is more. Oscar picked us up at 6:45am for our morning tour. 10 Days in Costa Rica: How Much Does It Cost?